"Mayor Rochester extends a welcome to Grand Lodge A.F.A.M. Prince Rupert." 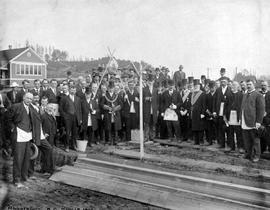 Ceremony for the laying of the cornerstone for the Victoria Shrine Temple at 1037 View Street Victoria. First Officers Of Meridian Lodge No. 108 A.F. And A.M. B.C.R., Vancouver. Frederick Dally; photographer and dentist. Meridian Lodge Orchestra Vancouver, BC. Quesnel Masonic Banquet And Dance. 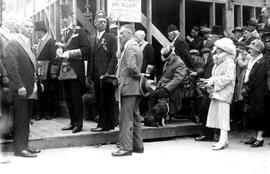 The Armstrong Masonic Lodge, left to right; Billy Hall, T.W. Fletcher, R.S. Pelly, George Rochdale, Fred Barnes, John Hamite, F. Van Buskirk, J.D. McDonald, Norman McLeod.